We cannot arbitrarily manipulate our currency. In an even worse crisis situation this would be disastrous and counterproductive. The floor must be legitimized. The current minimum exchange rate is realistic and has helped the Swiss economy. This stance was surprisingly different to the strong commitment about the floor he uttered previously: for months the SNB continued to vow that it might take further measures to weaken the franc, even if the wording changed from the “massively overvalued franc” in August 2011 over to “significantly overvalued franc” in January 2012 to “very very strong franc” in April. Based on the IMF Code of Good Practices on Transparency in Monetary and Financial Policies, Jordan gave such a clear and transparent message, which we translated into: The SNB will not raise the floor. Long-term investors can be sure not to lose money. During that period strong interventions started again. 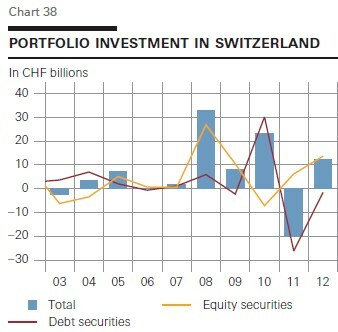 Foreigners mostly bought Swiss equities – and not Swiss safety aka bonds or cash. (source Swiss Balance of Payments). The SNB reacted increasing strongly the equity share in its foreign currency portfolio. In November, Swiss inflation had picked up only a little. Jordan has in the meantime weakened his language again: Tthe franc is now only “very strong”. We argue that the REER is misleading, in particular because of rising current account surpluses and strong immigration of highly qualified people in the last 15 years. In May 2012 Swiss Q1 GDP was released and, thanks to US, Chinese and global growth, Swiss GDP clearly outpaced expectations. At that moment the two wrong assumptions above turned into a blunt lie. The SNB bluff was quickly called by former UBS chairman Oswald Gruebel. Investors piled massively into the Swiss franc. Balance of Payments data published by the SNB itself showed that a big part of foreign inflows were risk-on investments (see graph). In 2011 and 2012, foreigners sold Swiss bonds. Equity investors are very sensitive to exchange rates that make stocks of overvalued currencies relatively expensive and they sell them. Hence, If the minimum rate had been defined at (for CHF) overvalued levels of 1.10, then the SNB balance sheet would be 30-50% smaller. If the EUR/CHF floor had been established at parity, then the SNB would have sold off nearly all reserves and the EUR/CHF might be back at 1.05 or 1.10. The choice of 1.20 as the floor was wrong. Together with excessively cheap money, this will turn into a boom with wrong investments.